The United States imposed a ban on Iranian products in 1987 in response to clashes in the Persian Gulf. Since the embargo ended two years ago, the floodgates have opened and the United States has seen new Persian carpets arrive literally by the boatload. The quality of Iranian rugs is all over the map. They have been described as “the good, the bad and the ugly,” but more on that at a later date. What we need to keep in mind is that rugs are fashion. Most rugs will decline in value. What was paid for a Kerman rug in the mid 1960s will not be paid for the same rug today. Those colors are not “in” now. What matters in today’s market are color and design, not country of origin. 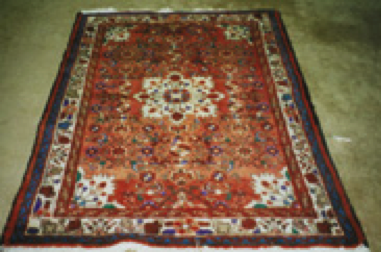 Rugs woven in the Hamadan district have been coming into the United States for decades, so it is important for the rug-cleaning specialist to be familiar with this old and (soon to be) new standard. The Hamadan district is a very large weaving area in northwestern Iran. It is actually a pocket of Turkish culture in Persia, as well as the most important center of carpet production in Iran. 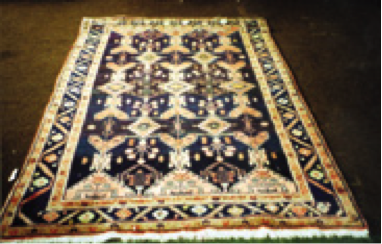 Rugs have been woven in the Hamadan area for hundreds of years as part of the local culture. Commercial production for the US market goes back about 100 years. It is a real mix of different cultures and rug designs. The region has approximately 600 villages in the area that contain as many as 40,000 looms. Hamadan is the market town for the villages that surround the area. Probably more rugs from this region have been imported into the United States than from any other area of Iran. Hamadans were the working man’s rugs between the World Wars. At the time, a 9-by-12-foot rug sold for about $50 to $75. During the same period a Sarouk sold for $395. The enormous variety of Hamadan rugs appear to have sundry and varying designs with little rhyme or reason, (Photos 1 and 2) but each design is highly restricted and corresponds to a specific village. Hamadans generally come in small sizes, utilizing the Turkish or symmetrical knot and cotton warps and wefts. Janice Summers Herbert describes the knot structure as “a combination of one shoot of wefts and warps on the same level giving a flat appearance on the back of the rug.” Only one heavy weft shoot passes between two rows of knots leaving a white spackled appearance on the back (Photo 3) that wouldn’t exist if two shoots of wefts were present (Photo 4). 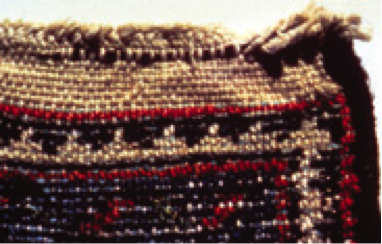 Because of this construction, Hamadans do not have a thick pile like the American Sarouk, and most old rugs are very worn. Hamadans are coarsely woven and usually have geometric designs, and look tribal or nomadic. This is a village or cottage household industry. While the rugs are made for export they have not really degenerated very much as a consequence of commerce with the West for so many years. The workmanship and materials can still be quite good today. I recently purchased a more traditionally sized 5-by-10-foot Hamadan from a major furniture retailer in Virginia. The cost was $149, or $3 per square foot! It is hard to imagine how the sheep can be shorn, the wool spun into yarns, the yarns dyed, the loom set up and the knots tied, the rug washed and sold to the local market, exported, sold to a wholesaler here and then to the furniture store, and still a profit can be made. This is the state of most Persian rugs today: they are sold on price. Look for new Persian rugs to be in the $10-per-square-foot retail price range. Persians are the new hot rug. You will see many Hamadans coming into your plant for cleaning in the next year. 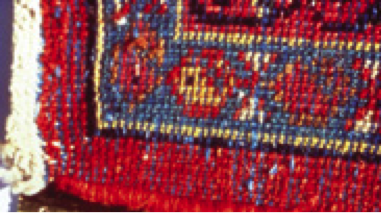 Become familiar with this standard rug, as it looks like the Hamadan will continue to be the most significant rug ever woven for export in the history of the craft.